The season for overeating and drinking may be behind us, but pastry chefs are hoping that diners won’t ditch dessert entirely. To keep diners indulging in the New Year without feeling too guilty, pastry chefs are serving up super-sized cakes, cookies and other confections meant for diners to dig into together. At Moody Tongue in Chicago, founder and brewmaster Jared Rouben recently opened a tasting room alongside the brewery where he is offering a curated menu of food to pair with the beer selections. The menu includes slices of a 12-layer German Chocolate Cake that can feed up to four people. A crumby almond cookie at Avvio Ristorante in Cranston, RI. The housemade German Chocolate Cake has alternating layers of espresso cream cheese, toasted pecan and coconut caramel filling, chocolate buttercream, and a chocolate cereal crust, all topped with a chocolate mirror glaze. The larger-than-life cake was co-created in collaboration with Rouben’s longtime friend, pastry chef Shannon Morrison, and is intended to pair with selected beers. Diners can create their own shareable layer cake at Stacked: Food Well Built, a full-service concept with five locations in California, where every dish is “built” to order by customers using an iPad ordering system. As part of the concept’s new skillet dessert line, guests can customize a shareable butter cake, topping it with layers of their choosing. Also serving a big-enough-to-share cake is Phillip Lopez, chef partner of The Troubadour Hotel in New Orleans. Lopez offers guests at Monkey Board, the hotel’s newly opened rooftop bar, a chance to celebrate over a classic birthday cake with sprinkles that serves four to six people. At Maple & Ash in Chicago, pastry chef Aya Fukai is offering Sundae Service, which includes a choice of housemade vanilla, chocolate or strawberry ice creams that are served alongside a tiered silver tray of homemade toppings such as hot fudge, salted caramel, whipped cream, chocolate crunch, toasted nuts, candied coconut, sprinkles and chocolate pearls. 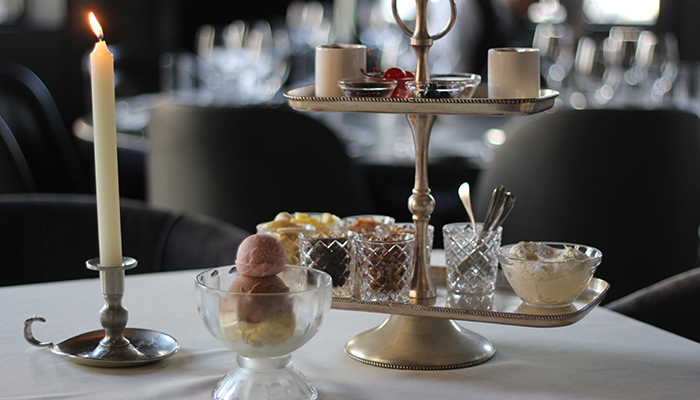 The Sundae Service is the restaurant’s most popular — and most Instagrammed — dessert, according to Maple & Ash. Maple & Ash in Chicago offers a shareable ice cream experience with its Sundae Service. Campfire s’mores in shareable sizes are making it onto menus at several restaurants. For example, Innovative Dining Group’s Roku, in West Hollywood, Calif., is offering Zen S’mores, an interactive dessert for four that is presented as a Zen garden featuring all the fixings for s’mores, including crushed graham crackers for sand, green tea and chocolate truffles, marshmallow cream, and a fire in the center for roasting marshmallows. “Sharing a dessert makes people feel like they are eating much less, so they are more inclined to order it when they are looking to cut back on desserts,” said Justin Leyvas, general manager of Sushi Roku in Pasadena. “Our Zen S’mores satisfy the sweet tooth without the guilt of overindulging,” he added. Although he created the dessert for the Pasadena restaurant, it proved to be so popular that the company is now offering it at Roku in West Hollywood, Calif., as well. Bad Daddy’s Burger Bar, in Raleigh, N.C., recently added a S’mores Skillet to its menu. The shareable dessert features gooey layers of chocolate ganache and toasted marshmallow served with honey graham crackers for dipping. There are 20 Bad Daddy’s locations across Colorado, North Carolina, South Carolina and Tennessee. The S’mores Skillet is available at every location, with the exception of Raleigh and Cary, N.C. 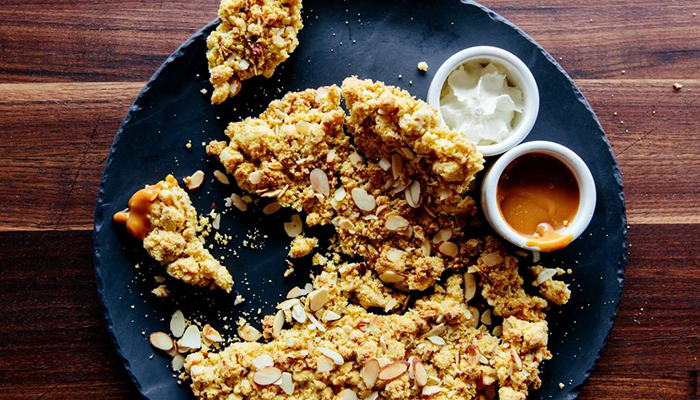 Meanwhile, chef Matthew Petersen at Avvio Ristorante, in Cranston, R.I., is keeping dessert simple yet shareable by serving Sbrisolona, a giant, almond-flavored, cake-y cookie meant to be eaten by breaking it apart by hand. Correction: Jan. 4, 2017 An earlier version of this article misspelled the name of the Troubadour Hotel and misstated the position of Phillip Lopez, which is chef partner.